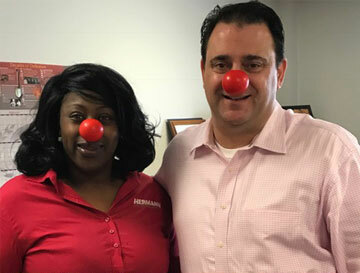 Under the leadership of Ebony Hunter and the sales team, Hermann Services participated in the Red Nose Event sponsored by Walgreens. The event uses the power of comedy to get people to come together to end child poverty, one nose at a time. 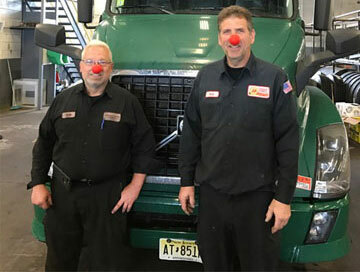 This year Hermann Services supported the mission for every child to be healthy, safe, educated, and empowered for the future by purchasing red noses, pens, and wristbands from Walgreens for company employees to use in representation of Red Nose Day. “It was a good feeling to join in with people companywide working in different departments and buildings and know that we were collectively making a difference,” said Ebony. In total, Walgreens raised $38,172,178 for the day this year! To learn more, please visit www.rednoseday.com.